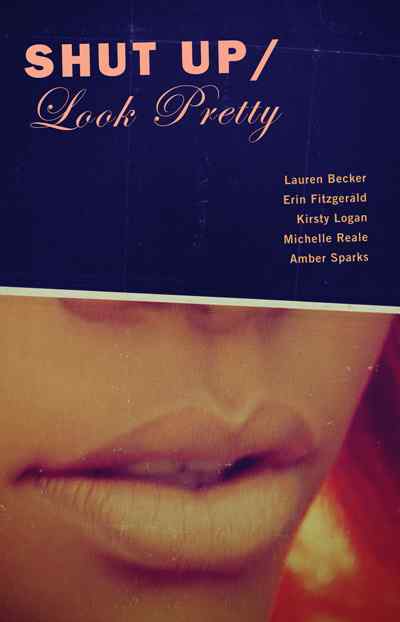 The Reviewed: Shut Up/Look Pretty by Lauren Becker, Erin Fitzgerald, Kirsty Logan, Michelle Reale, and Amber Sparks. This anthology is kind of a sassy young woman’s dream — maybe a guy’s, too, I don’t really know — but with a title like Shut Up/Look Pretty, this stunning collection featuring works by Lauren Becker, Erin Fitzgerald, Kirsty Logan, Michelle Reale, and Amber Sparks caters more to the quietly stewing female mind than to the more readable brain of a male (ha ha, I jest, I promise). Each of the short fiction collections and novellas in Shut Up/Look Pretty turns a specific lens onto specific characters, revealing emotions that linger beneath normal-seeming facades. In Lauren Becker’s selections, “Things About Me and You,” there is a focus on fractured relationships and how they came to be broken. In a longer piece, “Rituals,” a boy watches his neighbor dig a hole in his yard. The boy is socially awkward and the neighbor is grieving for his wife. The observation of the old through the eyes of the young gives a devastating perspective of what it really means to love, and what it really means to have lost. The prose in all of Becker’s pieces is so carefully selected and delicate that I found myself savoring each piece, but still moving fluidly into the next one. They all fit together like a jigsaw puzzle, bringing the broken pieces into a whole. Erin Fitzgerald’s This Morning Will Be Different takes on the every day in short vignettes. It’s not always clear what is happening in each of Fitzgerald’s stories, but what is clear is that something we as a society see as ‘normal’ has been corrupted not only by the individual within Fitzgerald’s words, but by the world as a whole. One particularly disturbing piece, “Where Did It All Go Wrong,” follows a woman whose family is struggling due to a lost job and the ensuing financial hardships. The ending image smacks the reader in the mouth so hard that it is difficult to discern whether the blood tasted on the tongue is imagined or real. Fitzgerald’s strength lies in turning the ordinary on its head. Local God, Kirsty Logan’s novella, is an oft-told story rendered in a hilarious, awkward, and devastating new way. Logan’s narrator is a part of a truly awful band with a self-absorbed lead singer. Francis Faskally is crude, egotistical, and obsessed with bedding his girlfriend’s lesbian roommate. What comes to pass between the narrator and Francis, however, shines a new light on who each young man truly is, and if he will be able to live as himself out in the world. As one of the only male-centric pieces within the anthology, “Local God” is more of a traditional story than the others within this collection, but that is not to say that it is old-fashioned. It tells an old-fashioned story in a unique way, and really brings its characters to life. Also, the title of Chapter 5, “The Winter of Mixed Drinks,” is an album by Frightened Rabbit, which is just plain awesome. After Logan’s novella comes What Passes For Normal, Michelle Reale’s collection of pieces that are startling in their adept perceptions of society. In the title piece, a girl observes her mother, who is looking after the neighbors’ mentally handicapped daughter. The mother’s actions – and her daughter’s inability to stop them – are horrible to watch. As a reader, you feel just as helpless as the little girl, and you wish you, too, could make the story end differently. Reale’s stories all encompass a miniscule world that stands in for our own. 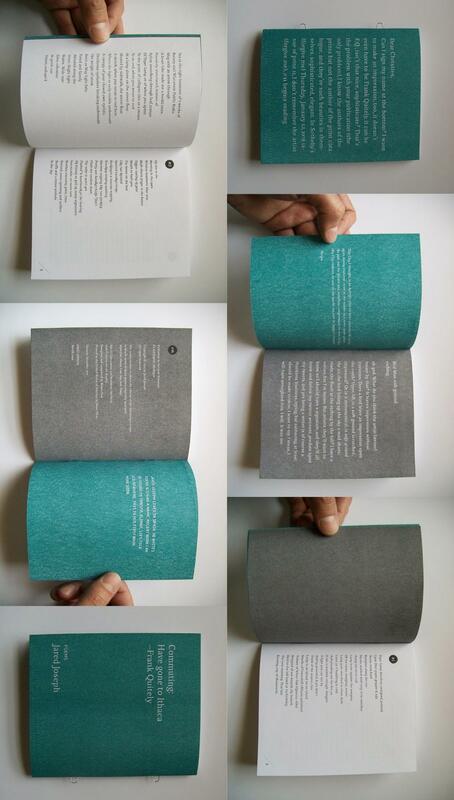 In pieces such as “Folk,” we get to know two characters in one extended paragraph – one page that, in its carefully chosen details, represents an entire, total relationship. Reale’s prose is precise and clean; she has honed beautifully written stories that shock and wow. Lastly, Amber Sparks’ five short stories, collected under the title Great Dark Sleep: Stories For The Next World, put a supernatural spin on the world. In the first piece, “The Ghosts Eat More Air,” a girl attempts to struggle out from under her father’s grief over the loss of her mother, a grief that takes the form of ghosts haunting their home. In another piece, a man has a heart attack and follows his body’s stages of decomposition. And in the final story, a man explains the “death houses” he has created for those who have not quite gone. Sparks’ stories are much more surreal than the previous four collections, but they still strike a nice balance. They are all relate-able, and are wrought in language so new that it seems Sparks has created her own form of speech. These five stories bring the collection to a complete close, ending on a phantom-like note that lingers in the mind for days to come. Talking with Furniture: Emma StraubIn "Talking with Furniture"
"Berthier Door" by Mark ReepIn "Fiction"